Carefully managing the presentation of self via technology is a core practice on all modern social media platforms. Recently, selfies have emerged as a new, pervasive genre of identity performance. In many ways unique, selfies bring us full circle to Goffman—blending the online and offline selves together. 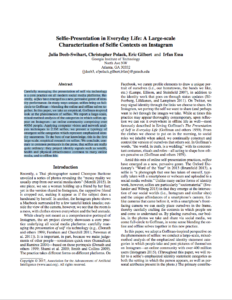 In this paper, we take an empirical, Goffman-inspired look at the phenomenon of selfies. We report a large-scale, mixed-method analysis of the categories in which selfies appear on Instagram—an online community comprising over 400M people. Applying computer vision and network analysis techniques to 2.5M selfies, we present a typology of emergent selfie categories which represent emphasized identity statements. 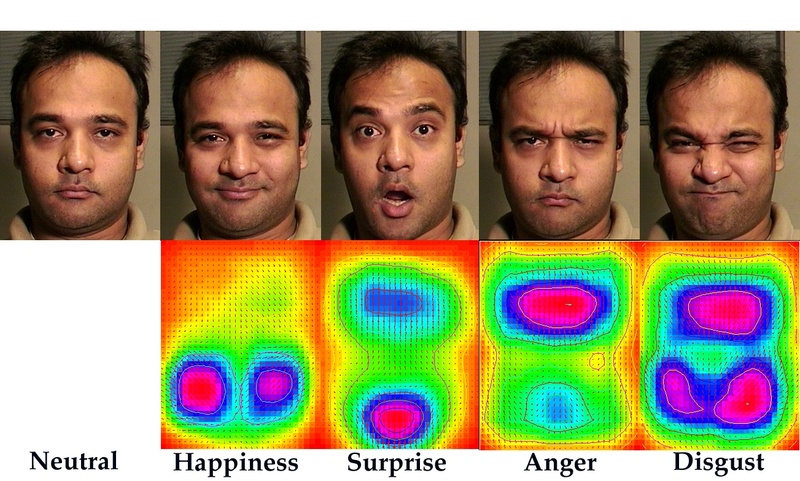 To the best of our knowledge, this is the first large-scale, empirical research on selfies. We conclude, contrary to common portrayals in the press, that selfies are really quite ordinary: they project identity signals such as wealth, health and physical attractiveness common to many online media, and to offline life. Presented at the International AAAI Conference on Web and Social Media (ICWSM), May 15 – 18, 2017, in Montreal, CANADA. Automatically recognizing classifier-based grammatical structures of American Sign Language (ASL) is a challenging problem. Classifiers in ASL utilize surrogate hand shapes for people or “classes” of objects and provide information about their location, movement and appearance. In the past researchers have focused on recognition of finger spelling, isolated signs, facial expressions and interrogative words like WH-questions (e.g. Who, What, Where, and When). Challenging problems such as recognition of ASL sentences and classifier-based grammatical structures remain relatively unexplored in the field of ASL recognition. One application of recognition of classifiers is toward creating educational games to help young deaf children acquire language skills. Previous work developed CopyCat, an educational ASL game that requires children to engage in a progressively more difficult expressive signing task as they advance through the game. We have shown that by leveraging context we can use verification, in place of recognition, to boost machine performance for determining if the signed responses in an expressive signing task, like in the CopyCat game, are correct or incorrect. We have demonstrated that the quality of a machine verifier’s ability to identify the boundary of the signs can be improved by using a novel two-pass technique that combines signed input in both forward and reverse directions. Additionally, we have shown that we can reduce CopyCat’s dependency on custom manufactured hardware by using an off-the-shelf Microsoft Kinect depth camera to achieve similar verification performance. Finally, we show how we can extend our ability to recognize sign language by leveraging depth maps to develop a method using improved hand detection and hand shape classification to recognize selected classifier-based grammatical structures of ASL. Pei Yin, Thad Starner, Harley Hamilton, Irfan Essa, James M. Rehg (2009), “Learning Basic Units in American Sign Language using Discriminative Segmental Feature Selection” in IEEE Conference on Acoustics, Speech, and Signal Processing 2009 (ICASSP 2009). Session: Spoken Language Understanding I, Tuesday, April 21, 11:00 – 13:00, Taipei, Taiwan. We propose the use of 3D (2D+time) Shape Context to recognize the spatial and temporal details inherent in human actions. We represent an action in a video sequence by a 3D point cloud extracted by sampling 2D silhouettes over time. A non-uniform sampling method is introduced that gives preference to fast moving body parts using a Euclidean 3D Distance Transform. Actions are then classified by matching the extracted point clouds. Our proposed approach is based on a global matching and does not require specific training to learn the model. We test the approach thoroughly on two publicly available datasets and compare to several state-of-the-art methods. The achieved classification accuracy is on par with or superior to the best results reported to date. We address the feature selection problem for hidden Markov models (HMMs) in sequence classification. Temporal correlation in sequences often causes difficulty in applying feature selection techniques. Inspired by segmental k-means segmentation (SKS), we propose Segmentally Boosted HMMs (SBHMMs), where the state-optimized features are constructed in a segmental and discriminative manner. The contributions are twofold. First, we introduce a novel feature selection algorithm, where the temporal dynamics are decoupled from the static learning procedure by assuming that the sequential data are piecewise independent and identically distributed. Second, we show that the SBHMM consistently improves traditional HMM recognition in various domains. The reduction of error compared to traditional HMMs ranges from 17% to 70% in American Sign Language recognition, human gait identification, lip reading, and speech recognition. We propose a new approach for combining acoustic and visual measurements to aid in recognizing lip shapes of a person speaking. Our method relies on computing the maximum likelihoods of (a) HMM used to model phonemes from the acoustic signal, and (b) HMM used to model visual features motions from video. One significant addition in this work is the dynamic analysis with features selected by AdaBoost, on the basis of their discriminant ability. This form of integration, leading to boosted HMM, permits AdaBoost to find the best features first, and then uses HMM to exploit dynamic information inherent in the signal. AI researchers are interested in building intelligent machines that can interact with them as they interact with each other. Science fiction writers have given us these goals in the form of HAL in 2001: A Space Odyssey and Commander Data in Star Trek: The Next Generation. However, at present, our computers are deaf, dumb, and blind, almost unaware of the environment they are in and of the user who interacts with them. In this article, I present the current state of the art in machines that can see people, recognize them, determine their gaze, understand their facial expressions and hand gestures, and interpret their activities. I believe that by building machines with such abilities for perceiving, people will take us one step closer to building HAL and Commander Data. This image was used in the article.